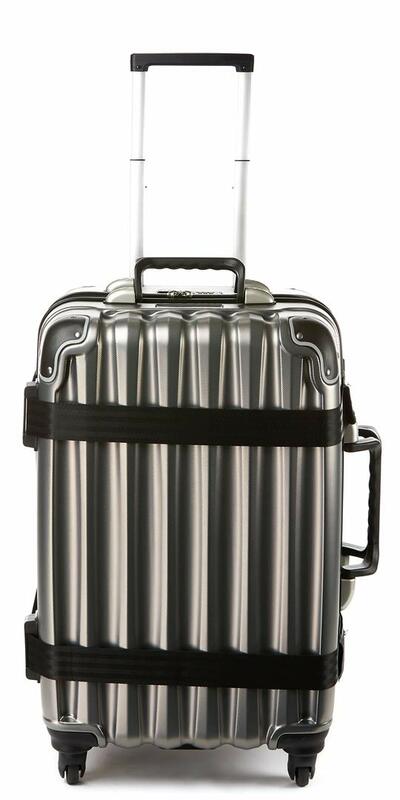 Silver VinGardeValise VGV05GRANDE Wine Travel Suitcase is their latest version as of March 2019 and has a capacity of up to 12 750ml bottles of wine or spirit. With the foam cavities you can actually place 750ml bottles of different shapes, not just the standard Bordeaux type bottles. The VGV05 is designed to ensure a very safe travel for your wine, beer and spirit bottles. The customizable ones come with a personalized luggage nameplate. It is rated 4.3 out of 5 stars by 11 customers at the time of this review. You can purchase it in black, silver and burgundy and each color with or without the customizable nameplates. VinGardeValise VGV05 weighs 13.75 pounds and measures 27 x 17.5 x 13.5 inches. And if you put inside 12 bottles of wine bottles that weigh 3.2 pounds each, it will weigh 50 pounds in total. It is made of hundred percent proprietary compound material and includes very dense closed cell foam inserts inside. 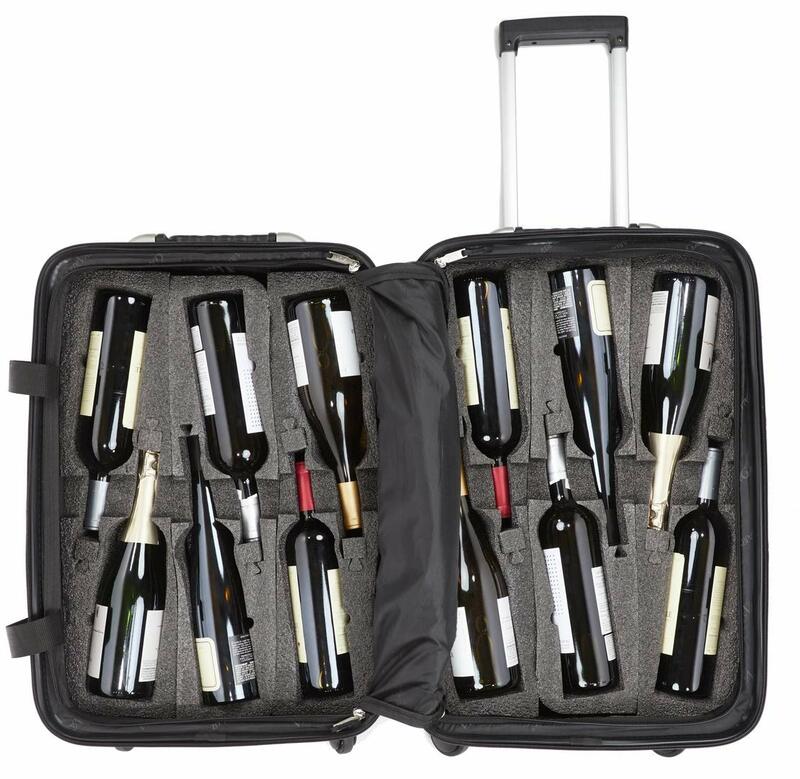 It is a very strong, robust and durable wine and spirit suitcase with the heavy-duty corner guards and a reinforcement bar and has a brand new ribbed design. Clothes and other personal items can also be put inside after taking out an insert or two. The double channel zipper is also quite strong as it is redesigned and strengthened. There is a built-in top flush mounted combination lock that is TSA compatible. The polyester burst straps are 3.8cm thick and are seatbelt-grade- very durable. The bag is very easy to maneuver even in tight corners as it comes with four robust and durable spinner asymmetrical Hinomoto wheels that rotate 360 degrees. You may purchase extra inserts with magnum size capability and temp controlling chiller sheets. It has a very flexible and versatile design with the foam cavities that can accommodate a variety of bottle shapes of beer, spirit and wine. And after detaching the inserts you can use it just like a regular suitcase for your clothes and other belongings. But if you’re carrying tall liquor bottles you can’t really fit in 12 bottles and you need to use their customizable inserts that you can purchase. Please note that this is not a carry-on size bag but a large 27” suitcase for wine bottles. And you can’t really get them through the security control onto the plane anyway (liquid restrictions). The 8-bottle capacity version VinGardeValise is suitable as a carry-on but that needs to be checked in at the luggage counter prior to your flight as well. You’ll find the instructions for setting the combo lock inside the luggage. It is very practical, versatile, flexible, functional, sturdy, strong, durable and spacious, and a bit expensive. But you’re getting what you pay for and it is well worth it if you’ll use it to a destination where wines cost heaps more and you can have a peace of mind that your bottles will be safe. It comes with a limited warranty of ten years by the manufacturer- VinGardeValise on any for the workmanship and material defects, as a proof of its sturdy construction and a company that stands behind their products. You’ll even get the HomingPin lost luggage locator system included with your purchase along with the subscription for the first 12 months after you activate the service.